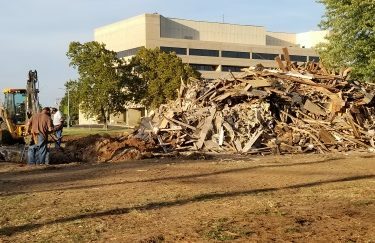 The last house in the 300 block of South Fourth Street was demolished this week to allow construction for a new Public Safety Center. One more property remains to be removed on the Third Street side before construction work can begin. The block is immediately east of the present Police Department building. 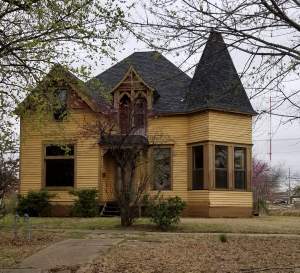 After the house was bulldozed, the City of Ponca City gave permission to members of the Cherokee Strip Treasure Hunters to search the area with metal detectors. Terry Anderson is president of the group, and members Jim Owens, Pat Walker and Gene Bickford searched the area on Tuesday, finding a few old coins from the late 1800s and other bits of metal. The house formerly at 320 South Fourth Street.